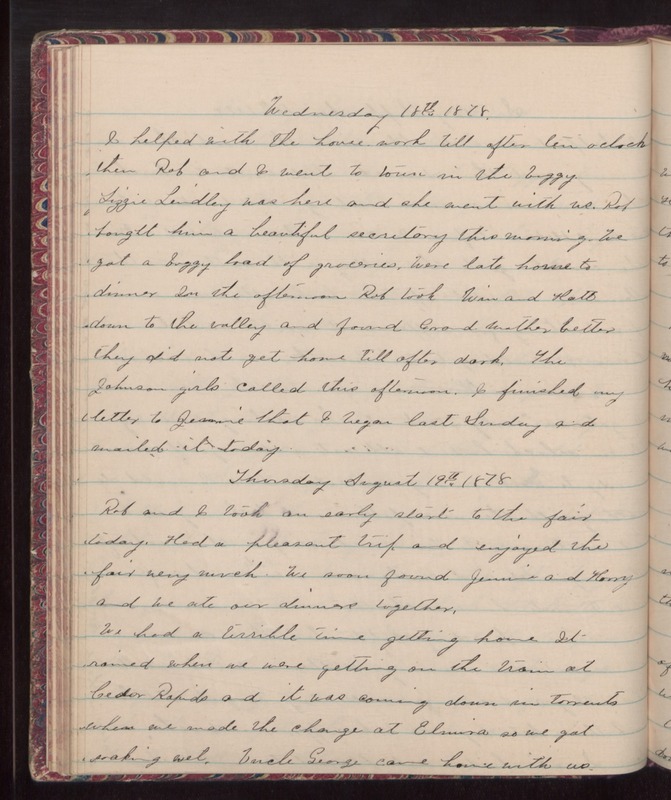 Wednesday 18th 1878 I helped with the house work till after ten oclock then Rob and I went to town in the buggy. Lizzie Lindley was here and she went with me. Rob bought him a beautiful secretary this morning. We got a buggy load of groceries. Were late [?] to dinner In the afternoon Rob took Win and Hatt down to the valley and found Grandmother better they did not get home till after dark. The Johnson girls called this afternoon. I finished my letter to Jesmine that I began last Sunday and mailed it today. Thursday August 19th 1878 Rob and I took an early start to the fair today. Had a pleasant trip and enjoyed the fair very much. We soon found Jennie and Harry and we ate our dinner together. We had a terrible time getting home It rained when we were getting on the train at Cedar Rapids and it was coming down in torrents when we made the change at Elmira as we got soaking wet. Uncle George came home with us.